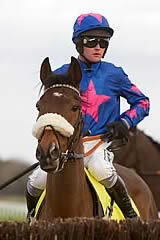 If Colin Tizzard was bursting with delight after Cue Card's easy win, he was not showing it. Unashamed pride was evident, and while the memory of his horse's Timico Cheltenham Gold Cup fall will never be erased, today's nine lengths and eight lengths win over Don Poli and Djakadam - who were third and second at Cheltenham - confirmed that Cue Card would have been very difficult to beat had he not succumbed to gravity three fences from home when easing into the lead. Tizzard said of the Paddy Brennan-ridden Cue Card, the 6/5 favourite: "I've been saying all season he's in the form of his life and he showed it today. Paddy was quite cool on him, when I thought he was going to be a bit closer to the front early on, but it was proved right. He has an engine on him - there's no bottom to him. "I think he might have won at Cheltenham, but they have to jump the fences and he didn't. You could see when he was in tight to a fence today he was better - he had never been on the floor before and I believe he learnt from it. It's relief now - you almost expect him to do it. It was so disappointing at Cheltenham and it felt like one had got away. Now I'm so proud of the horse - thank God he got up and the next day he was completely unscathed, like he hadn't been to the races. We schooled him this week, and he went into the first fence and looked at it, which was good. He just missed the fence at Cheltenham, that's all I can think. "Everyone has tried to write him off and he was disappointing last year, but to see him in the paddock before today's race and he's never looked so well. It's a brilliant day and it shows what a horse he is. "He's so relaxed he worries you a little bit. We changed the bit [in his mouth] today - he used to be in a Dexter bit with a ring in because he pulled so hard, but we took it off him today and just put a snaffle on to make him pull. But he doesn't need to any more - he would stay all day now. "He's not had a hard race and he's 10 now, so he will go to Punchestown." Owner Jean Bishop said: "That was very good. I didn't have any doubts, but obviously, with what happened before, you have got to be nervous about it. We have every confidence in Paddy and the horse." Willie Mullins' duo Don Poli (4/1) and Djakadam (5/2) were far from disgraced today but neither could prove a match for emphatic winner Cue Card (6/5F). Don Poli finished nine lengths back in second with Djakadam a further eight lengths behind in third. The pair came third and second respectively in the Timico Cheltenham Gold Cup. "We've no excuses," said Mullins. "I'm happy with the pair of them to a point, we were just beaten by a better horse on the day. Don Poli stayed on well at the end." Dynaste (33/1) was a further five lengths back in fourth and trainer David Pipe said: "He ran a cracker and galloped all the way to the line but the others were better on the day. He really wants further than three miles in this company. He might not yet be finished for the season, I will have a look at what there is for him."